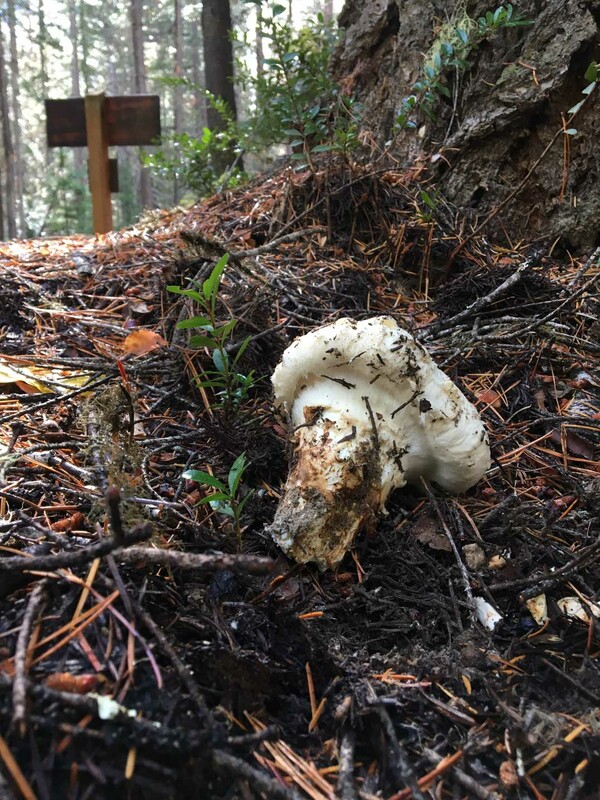 West Coast woods from NorCal to BC are loaded with oyster mushrooms right now—and it's nice to see the excitement they're stirring in foraging communities. 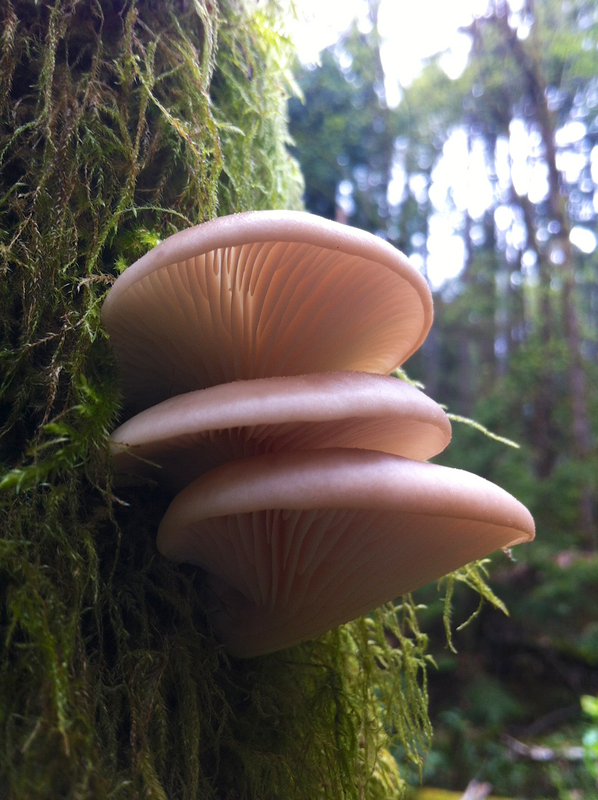 Lately I've been seeing photos of oysters all over online message boards and myco groups. Morels have traditionally commanded most of the vernal ink among mycophagists, but for a majority of us west of the Cascades the oyster is really the local fungus of springtime. I start looking for oysters (Pleurotus sp.) 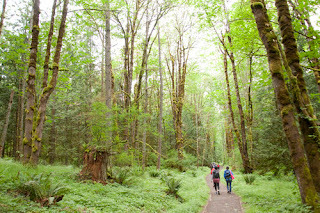 in lowland forests as soon as the temperature begins to warm and a few days after the first good rains. Some years I find them as early as late February though April is more typical. They'll keep fruiting throughout the spring and sometimes well into summer if regular rain continues, and then again in the fall. The saprophytic oyster mushrooms in the Northwest will usually be found in association with dead red alder or cottonwood. 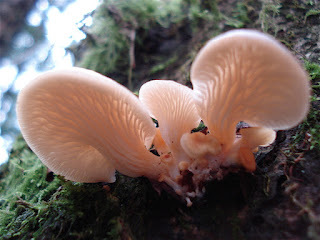 They look like clam shells growing off the sides of standing snags or fallen trees. Fresh specimens are creamy white, with hues of pink or tan. 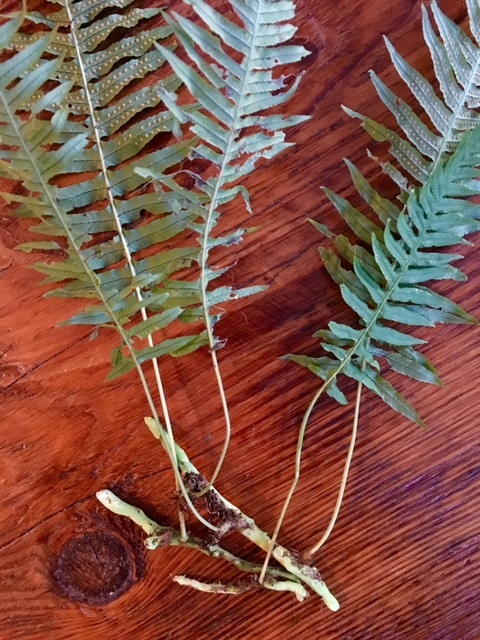 They have gills and stems that are off-center. 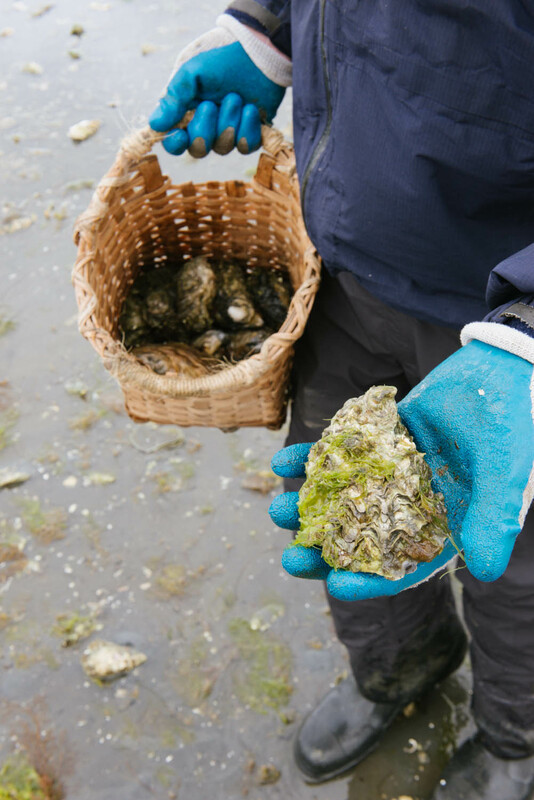 While you can buy farmed oysters at the market, I find the wild variety to be more flavorful, and I use them in all kinds of dishes from around the world, east and west. My go-to recipe of recent years has been a quick, delicate Chinese stir-fry that will appeal to those who prefer a less spicy Cantonese style, which allows the oysters to really shine. If you're vegetarian, skip the chicken or swap in tofu. 1. 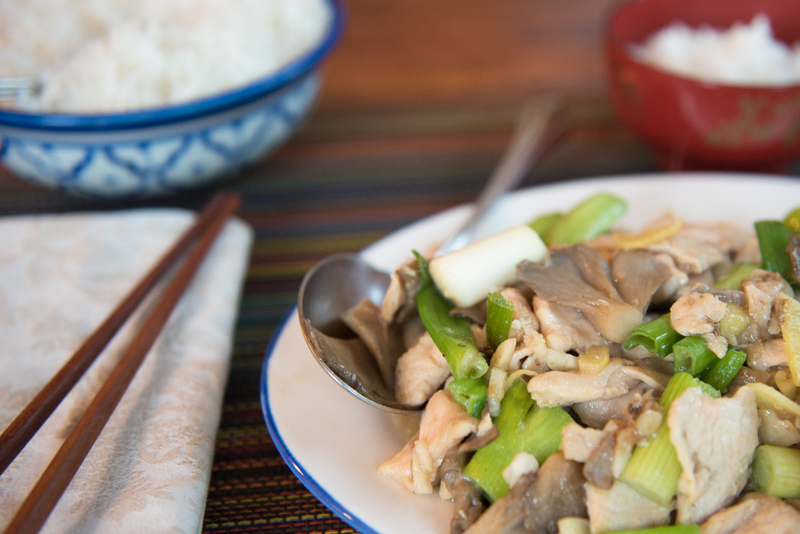 Combine sliced chicken in a bowl with marinade ingredients, stir, and set aside. Whisk together sauce ingredients in a small bowl and set aside. 2. In a wok over medium heat, sauté oyster mushrooms in 1 tbsp oil, stirring occasionally. Remove to a bowl when slightly browned. 3. Heat 2 tbsp oil in wok over high heat and add marinated chicken. When the chicken is partly cooked but still pinkish, add garlic, ginger, and green onion. Cook together, stirring, for 30 seconds until aromatic before returning oyster mushrooms to wok. Continue to cook together another minute or so until chicken is barely cooked through. 4. Pour in sauce, stir to coat, and reduce heat. Season to taste and serve immediately with rice. 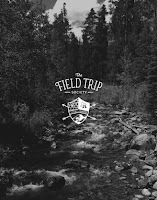 I've partnered once again this spring with both The Field Trip Society in Seattle and Bainbridge Island Parks & Rec to offer spring foraging trips by land and sea. Some of these classes are already sold out, so don't delay. Last year my friend Taichi Kitamura, chef/owner of Sushi Kappo Tamura in Seattle, gave me a set of two dobin mushi teapots he'd recently picked up in Japan, where "dobin" means teapot and "mushi" is steamed. These ceramic teapots are used to serve Matsutake Dobin Mushi, a favorite seasonal dish in Japan that relies on thinly sliced matsutake mushrooms to flavor a subtle broth as they steam in the pot. Other ingredients such as small pieces of chicken, fish, or shrimp along with a few thin slices of mild greens (e.g., yu choy, baby bok choy, or spinach) are also added. The teapot is served with a small upside-down cup fitted to the lid, with half a yuzu on top. 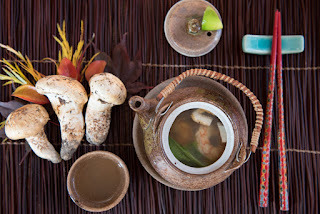 The steaming broth is then poured into the cup with a squeeze of the citrus and sipped like tea, while the ingredients in the teapot are eaten with chopsticks. It's a ritualistic meal that evokes memories of brisk walks in the autumn woods as the leaves turn colors and fall to the ground. 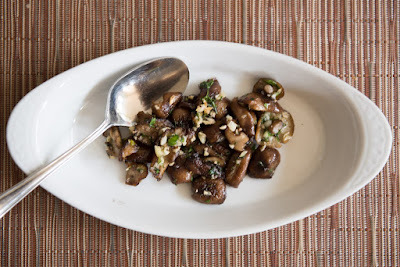 You may see sources online suggesting the substitution of matsutake with shiitake, oyster, or cremini mushrooms. Certainly you can do that—but you won't be experiencing the ethereal and aromatic treat that only matsutke can provide and which the Japanese call "autumn aroma." 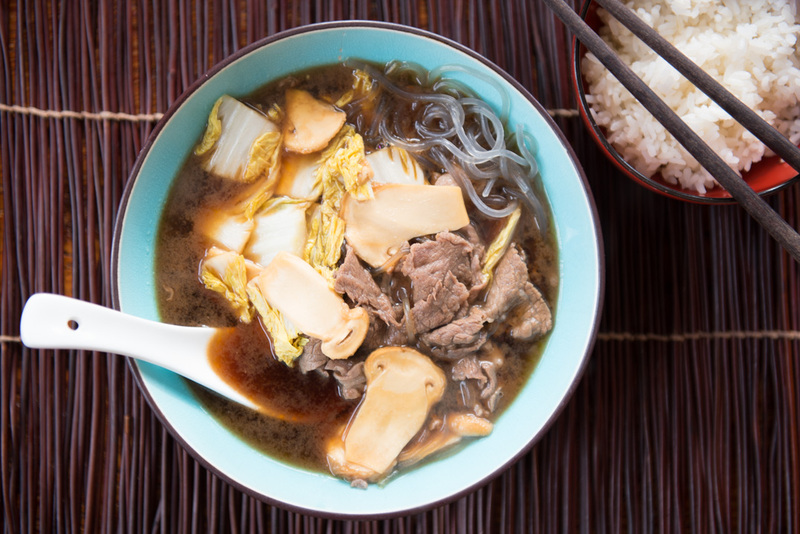 As for the broth, think umami. I asked Taichi for some tips. He makes a kombu dashi and adds manila clams and black cod bones. Shrimp shells work, too. Avoid aromatics such as onion, carrot, and celery, he advised, because they will over-power the mushroom. Season the broth with sake, soy sauce, and sea salt. Lastly, it's important to allow the matsutake slices to steep in the broth and impart their hints of cinnamon, spice, and fungus. Taichi recommends gently warming the teapots with all their ingredients in a bamboo steamer rather than cooking directly over flame. 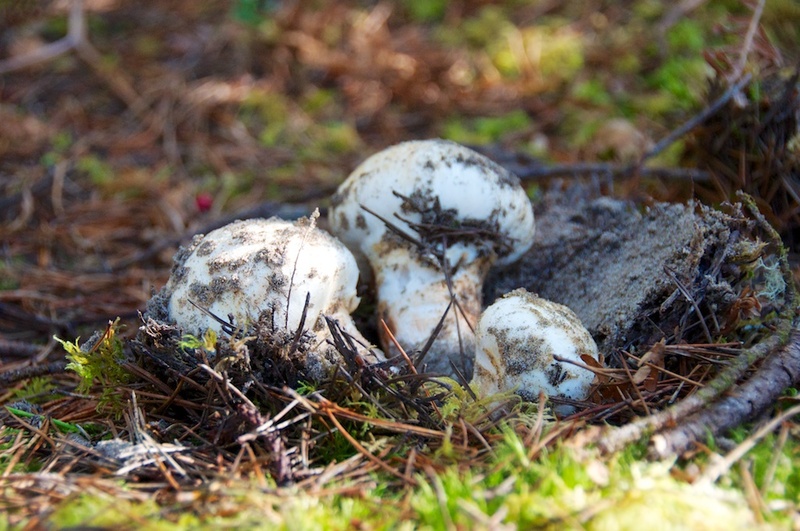 Matsutake mushrooms are pungent, with meaty texture—a little goes a long way. If you're buying matsutake in the market you'll be spending a frightening amount per pound (they were $70/lb at my local Japanese grocer the other day), but luckily you don't need a lot, so just get a small button to serve two. And if you can forage them yourself in the forest, all the better. 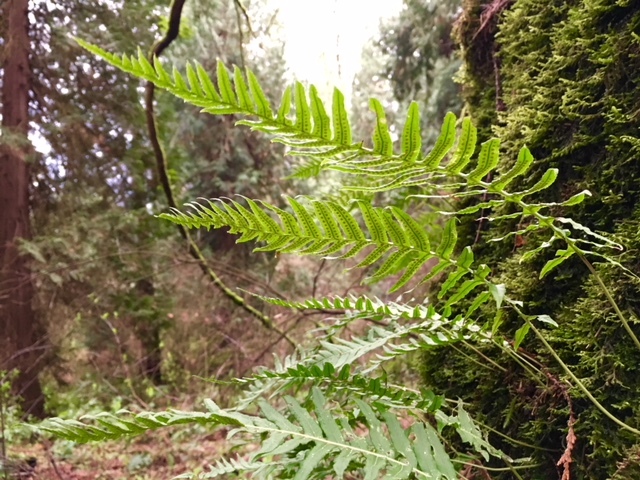 Mine came from a patch not far from Seattle, where I found several pounds of prime buttons pushing up through the moss beneath a Douglas fir. 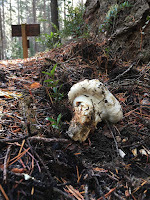 At the time I was hunting chanterelles, but I'll remember this surprise of a spot and return to it next year. 2 cups kombu dashi (see below) 20 grams kombu 4 manila clams 4 shrimp, peeled (reserve shells) 1 tbsp sake 1/2 tsp soy 1/4 tsp salt 1 small to medium matsutake button, thinly sliced 6 bite-sized, thin-sliced pieces chicken breast (or white fish fillet such as cod, rockfish, halibut) 2 baby bok choy (or other mild green), halved 1 yuzu, halved (or 2 lime wedges) 1. Make kombu dashi ahead. Soak 20 grams of kombu (dried kelp) in a pot with 4 1/2 cups cold water for several hours or overnight. 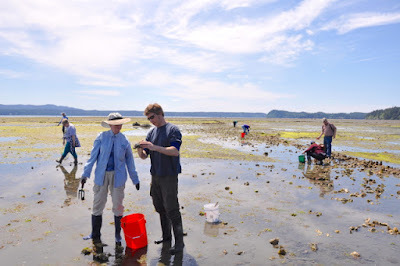 Bring nearly to boil before removing kombu with tongs. Boiling will turn the dashi bitter. Refrigerate dashi or continue to next step. 2. Heat 2 cups of kombu dashi in a pot with clams and shrimp shells. 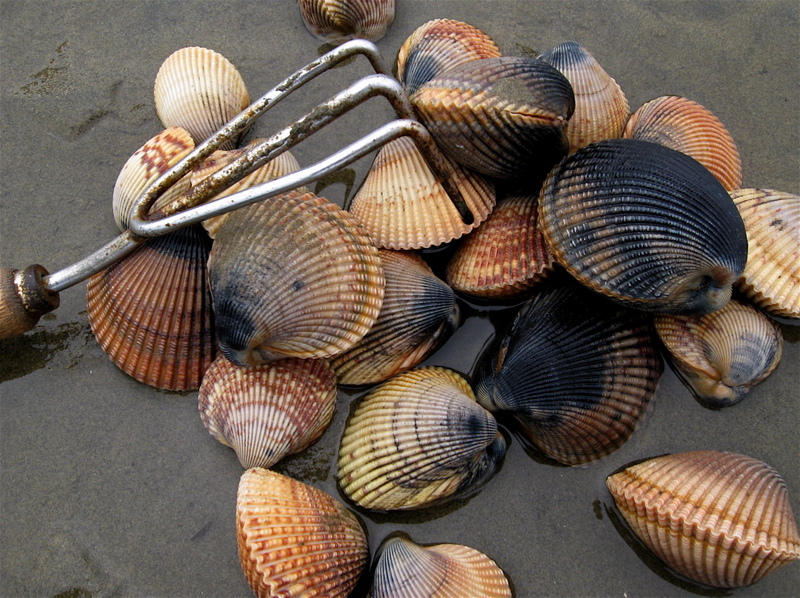 When the clams have opened, remove all shells. Season broth with sake, soy sauce, and sea salt. Simmer until alcohol has cooked off. 3. Divide equal portions of sliced matsutake, greens, shrimp, and chicken into dobin mushi pots, then add hot broth. Replace lids and heat teapots in a bamboo steamer over a kettle of boiling water for several minutes. (You can also steam in a wok with a rack and lid.) 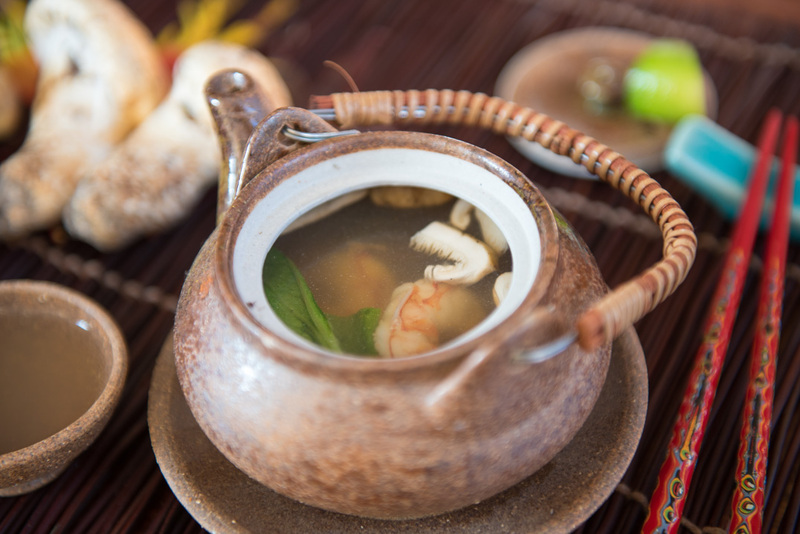 This gentle steaming allows the matsutake to fully infuse the broth while the shrimp, chicken, and greens poach. 4. Serve Dobin Mushi with a half of yuzu or lime wedge placed on top of each inverted cup. After removing the teapot lid, inhale the autumn aroma. Winter is on its way. 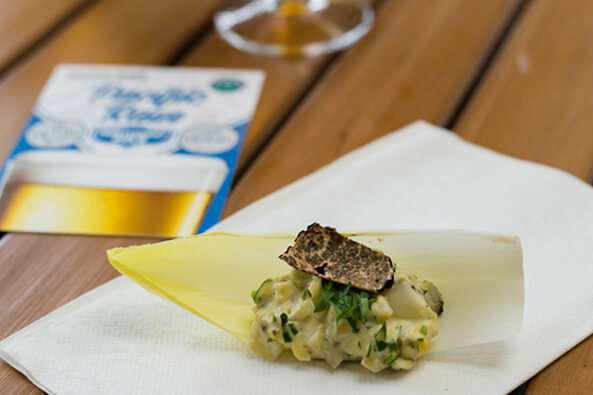 Now entering its 14th year, the non-profit Oregon Truffle Festival's mission is to educate the public about native-grown truffles in the Willamette Valley. With events and workshops tailored to truffle cultivators, foragers (and their dogs! ), chefs, epicures, and the merely curious, the festival celebrates a burgeoning culinary industry. 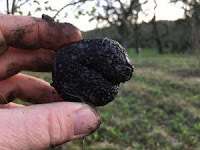 Truffles have been enjoyed for centuries in Europe, but it is only in the last decade or so that North American truffles have begun to appear on the gastronomic radar, including those wild black and white truffles endemic to the Pacific Northwest as well as European varieties such as the black Périgord that are now cultivated here. If you're intrigued by this newly emerging homegrown truffle culture, consider joining me January 25-27 for the festival's Urban Forager Package, an action-packed crash course that introduces food lovers to the fungi's ineffable pleasures. The package includes an Italian-inspired Friday evening at Marché Provisions in downtown Eugene for bites and drinks; a Saturday excursion (hosted by me) with stops at Mountain Rose Herbs, J. Scott Cellars, and the 5th Street Market (for more truffle bites and pairings), followed by the multi-course Grand Truffle Dinner that night; and a Sunday visit to the Truffle Marketplace for tastings, cooking demos, and talks. Bottom line: You don't have to travel all the way to France or Italy to experience the charms of truffle culture. In partnership with The Field Trip Society, I'll be offering the following classes and events this fall. Check this page for an updated schedule of events and additional classes. Everyone at the Mekong Market on Rainier Avenue knew what I was up to. The proprietor, a small gentleman always on the move, paused long enough to grin at the two packages of beef bones in my basket and give me the thumbs up. They were a dollar a pound. Then he frowned when he saw the big bag of dried noodles—and quickly guided me by the elbow to a refrigerated aisle, where he pointed at the fresh rice stick noodles. At the checkout, as I unloaded a bunch of basil, bean sprouts, a box of yellow rock sugar, and those fresh noodles, the Vietnamese lady in front of me said, "So you're making pho?" I explained that I had a sick kid at home and this was his request. It was my first attempt. Did she approve of the beef bones? Indeed. "But make sure to boil out the impurities," she added. This is a common refrain. All my online sources recommend a brief (three to five minutes) initial boil to exorcize from the beef bones what some call impurities and other call, simply, the scum. I'm all for getting rid of the scum. 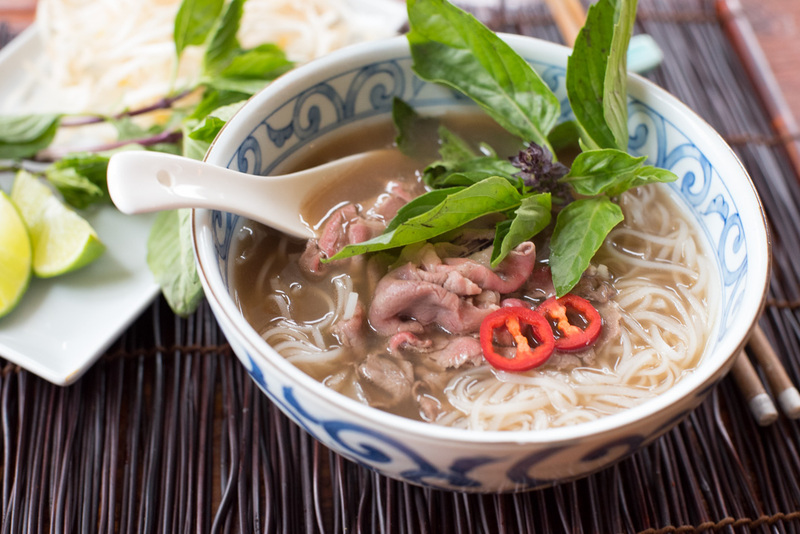 Here in Seattle there is likely more pho noodle soup for sale than any other dish. It's our favorite fast food. My kids have grown up with it and have some opinions. I wanted to do it right. 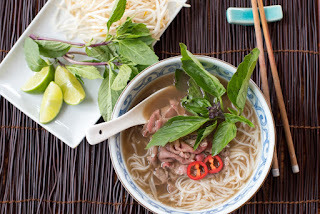 I split my batch of pho and designed a simple A-B test: one pot spiced with star anise and the other with licorice fern. The short answer is that both phos were smashing. 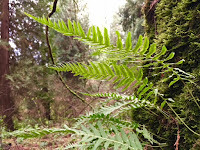 The licorice fern, however, won't end up as a local substitute for star anise in my future attempts. 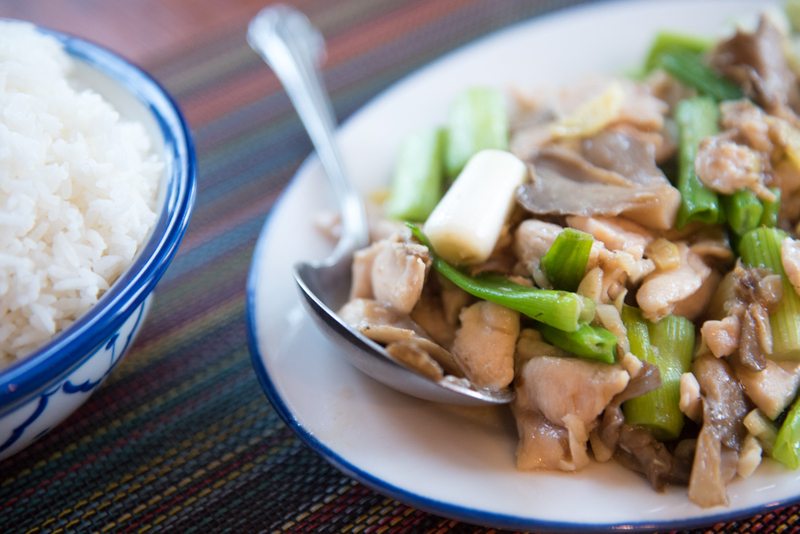 Instead, it proved to be yet another possible variation in an eminently malleable dish that's always been a cultural mashup from its earliest beginnings in French-colonial Vietnam. After testing the two batches, I recombined them. The fern root can't take the place of star anise, but like a stick of black licorice candy, it adds a back-of-the-palate sensation of spicy coolness—a palpable sensation similar to the way Sichuan peppercorn numbs and tingles the lips. There are plenty of very similar recipes online for pho. Most of them recommend using cut up beef bones (knuckles, shins, etc.) and doing an initial boil to cook out the foam and impurities. This results in a broth that isn't murky. Charring the onions and ginger in the broiler before adding to the broth is another crucial step. I adapted my recipe from this video. thin-sliced beef such as rib-eye, skirt, ti-tip, sirloin, etc. 1. In a large stock pot, cover beef bones with cold water and heat over high flame. 2. Meanwhile, heat oven on broil and place onions and ginger in a roasting pan just beneath heat. Roast 15 - 20 minutes, turning occasionally with tongs, until charred on all sides. 3. Toast spices (cinnamon sticks, coriander seeds, fennel seeds, star anise, and cloves) in a dry pan over low heat for 5 minutes, careful not to burn. 4. When stock pot comes to boil, cook 3 minutes so that scum rises to the surface. Drain in sink and rinse bones and pot with warm water. 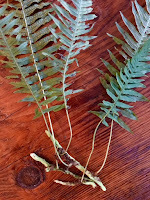 Return bones to pot and cover with 6 quarts of cold water. Bring to boil once again, then reduce heat to simmer. 5. Once broth is simmering, add roasted onions and ginger, fish sauce, salt, yellow rock sugar, toasted spices, and licorice fern. Simmer, uncovered, at least 3 hours. Skim off any scum that rises to surface. 6. Remove bones with tongs, then strain broth through a fine mesh strainer to remove remaining solids. Refrigerate broth overnight to easily separate remaining layer of fat, if desired. 7. 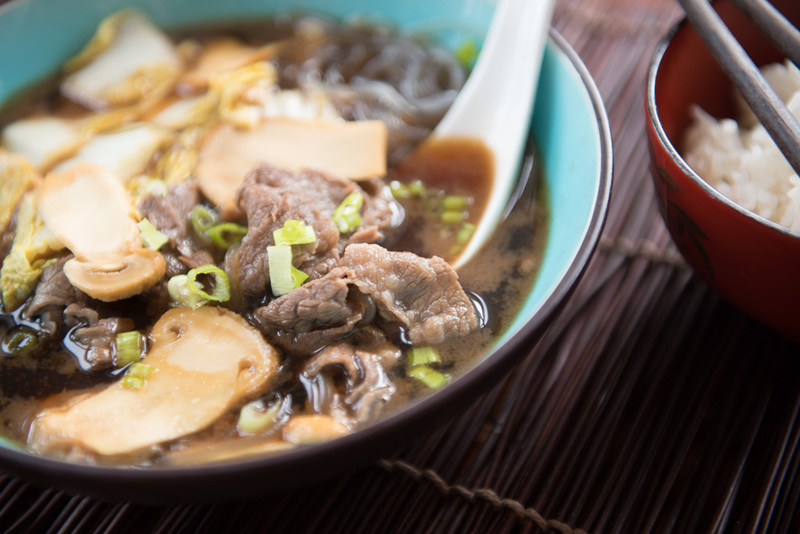 To assemble finished dish, add rice noodles and thin-sliced beef to bowl. Cover with hot broth and serve with bean spouts, lime wedges, hot pepper slices, and sprigs of basil, cilantro, and mint, along with condiments such as sriracha and hoisin.